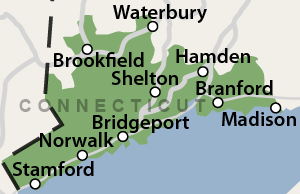 CT Painters is located in Monroe, CT, but services the entire state of Connecticut, including the Greater Southern CT and Fairfield County area. Whether it's interior painting or exterior painting, let the fully trained professionals handle it. Our use of high quality paint and materials will leave your home looking better than ever.